Prunella Pacey was born in Durham (England) into a musical environment: her mother was the composer-pianist Margot Wright, who used to accompany Kathleen Ferrier. Prunella was fortunate enough to have this great singer as a godmother and an inspiration for her viola-playing. 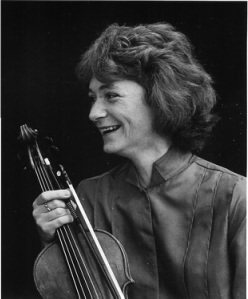 For many years Prunella Pacey has been a well-known figure in the viola world. After winning scholarships to the Royal College of Music and the Hochschulen of Vienna and Detmold Prunella performed widely as a soloist and was a finalist in the BBC Viola Competition. Her specialization in the string quartet led to a first prize at the Haydn International String Quartet Competition in Eisenstadt, Austria. She received invitations from the Bay Chamber Players in Maine, U.S.A., to take part in three of their summer seasons and subsequently became Principal Viola of the Royal Northern Sinfonia Orchestra. Having played chamber music since the age of ten, performing in Europe and the U.S.A., she became the viola-player of the Allegri String Quartet with whom she toured extensively and made many recordings. After moving to the Netherlands in 1982 Prunella branched out into numerous viola-playing activities. She was invited to join the Rondje Players (Isidor Lateiner, violin) in their long-running chamber music series in the Amsterdam Concertgebouw. Her Duo with the pianist Frank Mol who died tragically in 1999 culminated just two months before his death in a collaboration to make a CD of Prunella's mother's chamber music and songs (see recordings Margot Wright). Other activities included membership of the Dutch Mondriaan Quartet, specializing in modern music, and the making of more than twenty-five CDs. These include the labels EMI, Decca and Etcetera. Prunella has taught viola and chamber music at the Utrecht Conservatory since 1986 and is currently a member of several chamber music ensembles including the Arto Ensemble and the Cugnon Consort. She is a frequent performer and guest teacher at international festivals including the Xenia Chamber Music Course near Turin in Italy. Prunella and is consultant viola teacher at the Royal Welsh College of Music and Drama since 2006. Prunella lives in the Netherlands and has a son and a daughter. Her family ensemble, the Fabius Ensemble, is made up of her cellist partner, Guus Fabius and their daughter, Rosina Fabius (mezzo soprano) who arranges voice repertoire for this unique combination.